Our most popular kneeboard, designed for general aviation aircraft without a center stick, including most Beech, Cessna, Piper aircraft and more. Technically, the Model A1-MC is a tri-fold design with a reduced size "mini-cover" on the left side, that supports the contents of the ring binder, but doesn't get in the way. 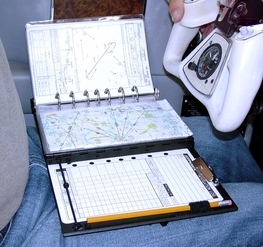 The A1-MC can also be used as a simple clipboard for preflight checks when closed. The A1-MC is 9" long by 8" wide, and has a width, when fully open of around 16". Check out some other designs in the ORGA-KNEE-ZER TM product family, including the original Model A1 and the Multi-Board TM. Note: The Model A1 and Multi-Board TM (below) are currently out of production. Please contact Scott Wings if you're interested in a volume order of these models. Our original ORGA-KNEE-ZER TM is designed for the pilot with a roomy cockpit (as might be found in many Beechcraft). In this full tri-fold design, the outside (left) cover is rigid, and hinged, providing support for the contents of the standard 7-ring binder and allowing the pilot to extend the writing pad beyond the support of his thigh. The A1 is 9" long by 8" wide, and has a width, when fully open of around 21.5". 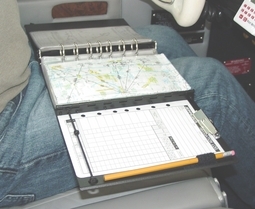 The A1 can also be used a a simple clipboard for preflight checks when in the closed position. Designed for the pilot requiring a single-surface kneeboard due to space restrictions (as might be found in many experimental aircraft). Employing several of the design elements used in other ORGA-KNEE-ZER TMmodels in addition to some novel new features, the Multi-Board TM is a configurable pilot kneeboard supporting a variety of navigational data, adaptable to a pilot's individual needs and methods of use. Whether center-stick or yoke, VFR or IFR, NOS, Jeppesen or Flight Guide user, the Multi-Board TM is a breakthrough in kneeboard design and clear winner in style. The Multi-BoardTM measures approx. 10"L x 7"W x 2 3/4"H. Includes all items shown below.